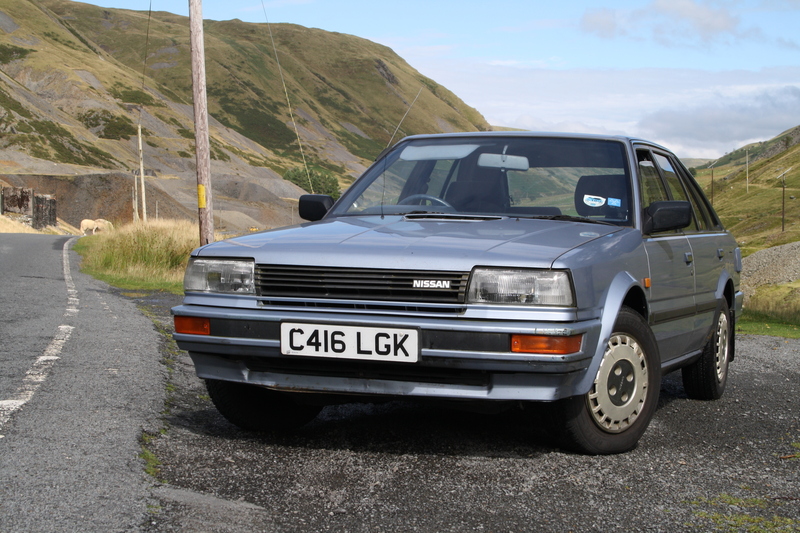 New car: 1986 Nissan Bluebird 2.0SLX – HubNut – celebrating the average! So, I bade farewell to the Mk1 BX on Sunday and enjoyed having some actual money in my possession. It was a novel, unusual and pleasant sensation. It didn’t last long. About an hour in fact. You see, I’d delivered the BX to its new owner on the proviso that he gave me a lift to Bristol to pick up my new steed. The new steed is a 1986 Nissan Bluebird 2.0SLX in Sky Blue. It’s the polar opposite of the BX, yet shares a number plate containing the same letters in the same sequence! Both cars were registered in the same part of South London, and both were purchased by me in Bristol. There are some major differences though. 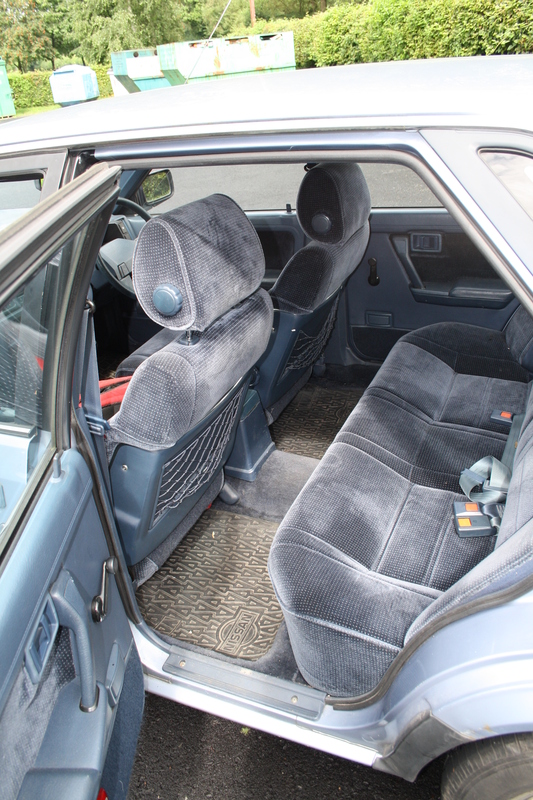 The BX had already clocked up 230,000 miles by the time I got my grubby paws on it, and it was in a dreadful state. The Bluebird has an incredible 36,000 miles on the clock and is in much, much better condition. The BX was a rarity, being the only RHD Mk1 estate known to be in roadworthy condition. The Bluebird is also a rarity, being one of very few T12 Bluebirds on a C-plate. In fact, I’d be willing to say it’s possibly the earliest Bluebird on the road – even earlier than the one Nissan has in its own collection at Sunderland. That’s because British production didn’t get underway until late 1986. For the first few months, the cars were entirely constructed in Japan. Despite the rarity and it’s great condition, it was struggling to find a buyer. It had been on the market since May with a very reasonable £450 asking price. It failed to garner any interest at all on Ebay, which all rather goes to show that the market for 1980s classics just isn’t really there yet. Pretty blue inside and out! Oh well. The world missed a great opportunity and I was able to bag a low mileage stunner for all of £400 with tax and test! (albeit not a vast amount of either). I’ll admit, it’s not the most exciting of vehicles, but the more I drive it, the more I like it. Sure, it feels pretty dismal dynamically compared to a BX – the ride and body control when cornering are laughably inferior – but it feels pretty planted, safe and secure and is quiet and peaceful on the move. I was able to listen to the cricket on Long Wave in great comfort on my drive home from Bristol. The engine is good too. Sure, it doesn’t sound very pleasant, but then few straight-four engines do. What I love is the torque. Maximum grunt comes at 3600rpm, but the torque curve is flat, and it pulls readily from 1500rpm in a way modern petrol engines just don’t. It sounds pretty breathless when you rev it, but there’s little performance to be gained by doing so, and it’s a lot more pleasant to keep the revs down and allow the car to gather speed more gently. It still doesn’t hang about, though it won’t accelerate in a way that would cause excitement. That’s ok, because it doesn’t corner in a way that would cause excitement either. The steering is nicely weighted with reasonable feedback but it still feels a bit dead, and the car does not feel composed. It doesn’t encourage you to push on, but you can corner reasonably quickly without too much fuss. Nor is the ride brilliant, being bouncy over poor ground. It’s not bad, but it’s not excellent either. Despite this, the more time I spend at the wheel, the happier I am. There’s the marvellous pantagraph rear wiper for a start, and the delicious twin-bell warning if you leave the lights on. So much nicer than a buzzer. The seats are fabulous too, and visibility is excellent. It’s no wonder that the Bluebird became a favourite with minicab drivers. It deserves a wider appeal though, and I hope that by owning this car and shouting about it, I can help raise the profile of the T12 Bluebird and its T72 replacement. These are fine cars and more people should realise that. Sounds dreadful, when are you going to buy a good car?